Download Your Free Tutorials on Drawing for Beginners Today! Have you always wanted to learn how to draw? Are you interested in brushing up on drawing basics? Whether you’re looking for lessons on drawing for beginners or beginner sketching tips to improve your art, the experts at Artists Network have you covered. These drawing exercises to download include all the fundamental step by step sketching tips you need to get started. You can download these lessons right now and embark on a whole new journey of artistry. There are 26 free beginner drawing techniques offered in these free beginner sketching lessons, which can help you learn how to draw a cylinder, sphere, cube, or circle, and ways to use these skills to advance in your sketching adventure. What’s inside this drawing for beginners guide? Learning to sketch can be quite a daunting process, but with these 26 free step by step sketching lessons you will pick up the basics in no time. One of the first steps of simple drawings is mastering the art of drawing shapes. The cube, the cylinder, and the sphere are the fundamental shapes an artist must learn in order to achieve a deeper understanding of all forms when learning to draw. This drawing for beginners tutorial offers step by step art lessons for beginners, easy drawing exercises for all, and a great way to improve your technique. Drawing shapes correctly will greatly ease and enhance the rendering of most natural objects in your drawings. The cylinder, which is a combination of cube and sphere drawing, is the perfect shape to learn how to sketch first. Learning to draw cylinders is essential, particularly in a still life, because an artist is continually confronted with ellipses found in items such as a plate, bowl, glass of wine or any other cylindrical man-made form. There are also many cylinders in figure drawing. Before you can become a cylinder drawing expert, you must first learn how to sketch an ellipse and properly construct a circle. Circle drawing can be difficult without proper guidance, but with Jon deMartin’s various illustrations to help you learn how to draw a circle, it becomes easy drawing for everyone. He explains how a circle becomes an ellipse when tilted away, because of perspective. Learn how to sketch successful ellipses without distortion with these detailed beginner drawing exercises. The eye cannot see halfway around a cylinder, so it is important to learn how to observe a cylinder correctly. These step by step drawing instructions show the process of drawing a cylinder out of a cube—you must be able to draw a good cube in perspective before you can build a successful cylinder. The detailed illustrations in this free eBook will help you understand the different steps required to learn how to draw a cylinder and how to correctly position cylinders in space. 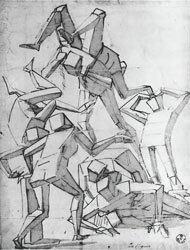 Artists for centuries have related basic geometric solids to the human figure. In these drawing exercises, you will learn how much the human figure is truly made of cylinders that are different sizes. Several illustrations provided in this free drawing tutorial help you conceptualize this idea that even our fingers are constructed of cylinders. Understanding the axes of these forms increases our ability to conceptualize their volumes in space. By utilizing these constructs, artists can achieve a greater awareness and appreciation of a model when sketching faces. The potential for the model’s movements are limitless but finding the direction of the forms when drawing shapes is a very important technical consideration. The sphere and the ovoid are two forms that should be thoroughly studied to aid in the depiction of naturalistic objects of all kinds including the human figure. The sphere, no matter how you view it, will always retain its original shape. The ovoid has an odd shape that makes it more natural for sketching figures because the human figure is not designed with perfect circles, as we all know. The sphere, a ball, and ovoid, an egg, are the two main geometric forms that represent curvature going in two different directions. Drawing lessons for beginners should always include learning to draw a sphere, because spheres can greatly aid your efforts when drawing many organic objects. Jon deMartin suggests learning to draw a sphere by drawing one inside a square. There are many more helpful tips given in this drawing lesson, not only about spheres but ovoids as well. An ovoid is slightly more difficult to draw than a sphere because of its irregular shape. Ovoids are generally used to create a more naturalistic object, like sketching faces. Learn to draw the cube and you have a good introduction to basic perspective and to one of the geometric building blocks of all objects—including the human figure. This is a must in drawing for beginners and is well laid out in this free guide. The cube makes for easy drawings in perspective. The ability to draw a cube from any angle, from both life and imagination, is essential for good craftsmanship. Once the skill is gained in drawing a cube, it’s not difficult to apply that knowledge to more complex subjects. The cube looks simple, but it’s actually complex and requires both keen observation and knowledge of construction and perspective. If one can’t draw a cube in perspective, then drawing a head will be impossible. Drawing shapes can be quite tricky, but with the expert advice from Jon deMartin you can learn figure sketching more accurately in no time. Learn to sketch now and begin understanding all the drawing techniques necessary when learning how to draw for beginners.